Rocky’s Ace Hardware is your holiday decoration destination this season, offering fresh-cut and pre-lit trees, along with a variety of lights, wreathes and garlands. The holidays are quickly approaching, and the best time for hanging your holiday decorations is before the weather turns wet and cold. Not only is it easier and more comfortable to work in milder weather, but it’s also safer when navigating on ladders and roofs. Here are tips to help you become a holiday illumination professional this season. 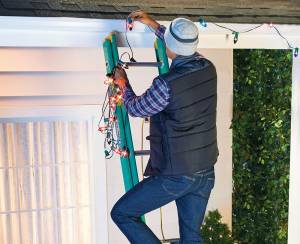 It’s best to get as much preparation done, such as running outdoor extension cords or installing hooks or hangers, prior to hanging your lights. To save time and frustration, always plug lights in to check that they work before stringing them. Develop a plan for where your lights will go and make sure you have enough working strings for each area. Use a long tape measure to determine the number of strings you’ll need. Rooftops: If you string holiday lights on the rooftop, use plastic clips to attach them to the shingles, preventing damage and the need for holes. Bushes: Add netted lights to bushes. They provide quick, easy lighting for your yard. For best results, decorate bushes of similar sizes and shapes. Doors: Line your front door with a lighted garland. And of course, complete your holiday home with a wreath on front and back doors, perfect for family photos. Walkways: Illuminate walkways and paths for safety and added festive flair. Be creative, using items such a giant candy canes, to usher guests into your winter wonderland. Add holiday pillows to seating and beds and a holiday throw on your sofa. Fill a vase with holiday decorations, pinecones and acorns, or candy. Display nutcrackers and poinsettias throughout your home. Create a holiday card display. String lighting and garland on archways. Light holiday candles and filled potpourri holders with a holiday scent. Don’t forget the mantel! From twinkling lights and stockings to candles and garland, you can make it a festive focal point of your holiday display. The crown jewel of any homeowner’s Christmas decorating is the tree. The secret to decorating your tree is simple: add style in layers. Lights go on first. A common rule of thumb is for every foot of tree, we suggest you string around 100 lights, but it’s up to your discretion. Start at the base of the tree trunk and work your way up, wrapping lights around every major branch. If you want a fuller looking tree, we recommend adding garland, roughly nine feet for every foot of tree. The final step is hanging your ornaments. Showcase your favorites in prime positions on the tree and then evenly space larger ornaments around them. Fill in gaps with medium-and small-sized ornaments and hang some closer to the trunk to create depth. Start arranging your holiday display at your local Rocky’s Ace Hardware today! We carry an array of fresh-cut and pre-lit trees, along with wreathes and garlands. We offer a variety of holiday lights featuring traditional incandescent, LED, icicle, globe and bubble lights, along with slide show projectors, a growing trend in the holiday lighting arena. Plus, we have the batteries to keep your lights running all season long. View our holiday offerings in our latest ad or talk to our professionals to help you make your list, and you won’t have to check it twice!